Hi everyone! Welcome to this month’s Creative Construction with Blueprints! For this project, I went for an underwater scene. No tiny hearts or sweet mermaids, just fishes and an anchor. I think this could be perfect for a guy! No need to use only masculine elements or stamp sets for a masculine card. I chose Blueprints 8 to create the layout. I cut out the rectangle from white cardstock and then, I die cut the scalloped border on one edge. As I kept the negative part, it looks like waves. I used the ink smooching technique with Distress inks to color the panel. A few months ago, I made a video tutorial for this technique HERE. The fishes and seaweeds are from the Birdie Brown Mermazing and Ocean Pals stamp sets. 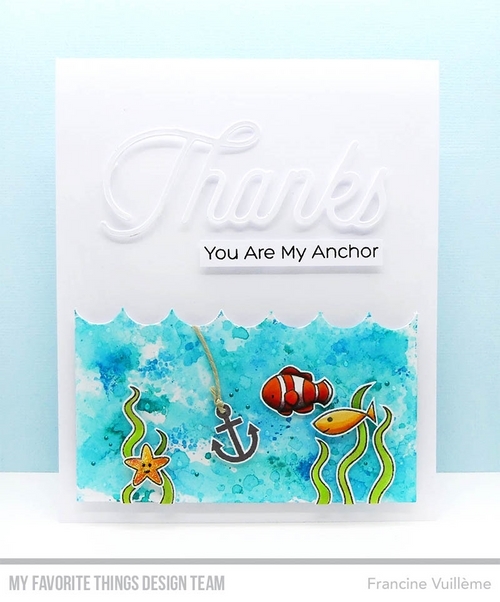 The anchor as well as the stamped sentiment are both from the You Float My Boat set. I stamped the anchor in Steel Grey dye ink and the sentiment in Black Licorice dye ink. The Thanks word is from the Twice the Thanks Die-namics set. I fixed all elements with foam pads. Head over to the MFT blog to check out what the rest of the design team has created! Don’t forget to check my MFT Gallery on Pinterest for more inspiration!